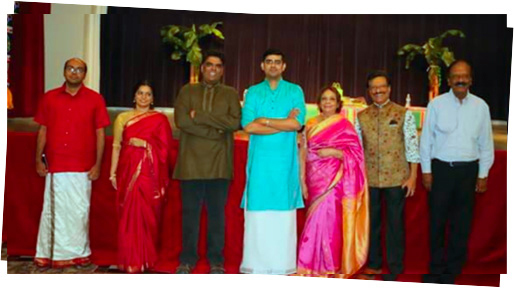 An extraordinary musical feast titled 'Layasagaram' organized by SN OM Trustee from Maryland, Sowmiya Narayanan and Abhishek Balakrishnan violin virtuoso and a good friend and well wisher of Sankara Nethralaya drew a good audience at the Westchester Academy, Houston on the 6th of October 2018 and helped in reaching across the SN OM Trust's appeal to support cost free treatment to the indigent visually impaired in India. The violin trio of Abhishek Balakrishnan, Kamalakiran Vinjamuri and Sanjith Narayanan blended their string octaves with the reverberating power of the Mridangam by Karun Salvady, Vignesh Venkatraman, Table-Aditya Srivatsan and Ghatam-Sowmiya Naryanan, the synergy of this wonderful music medley helped in winning new hearts to SN OM Trust's noble cause. 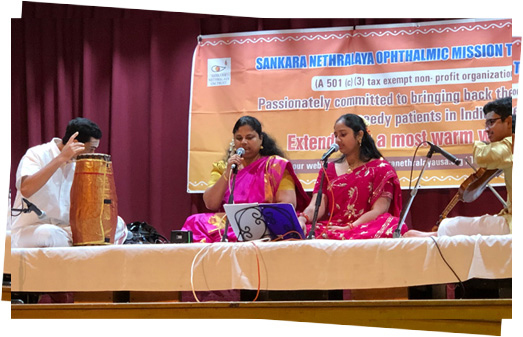 Sowmiya Narayanan, Ghatam exponent and SN OM Trustee from Maryland leveraged his immense talent and goodwill with the Carnatic music fraternity to organize two highly successful fund raiser concerts, one at Tampa Bay, Florida and the other at Maryland. The experimental nature of the music being conducted in the ancient 'Jugalbandhi' style was a 'First time' musical experience and quite naturally raised a lot of excitement and expectation among music lovers in the regions where the concerts were being held. 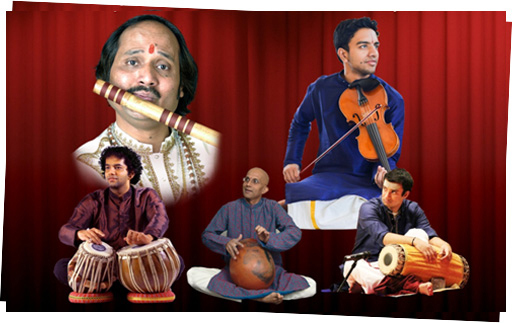 The sublime and mellifluous mixing of the tunes from the wood wind section and chordophone instruments by Maestros Ronu Majumdar-Bansuri Flute, Kamalakiran Vinjamuri- Voilin, Amit Kavthekar-Tabla,Vignesh Venkatraman- Mridangam and Sowmiya Narayanan-Ghatam exceeded the expectations of the rasigas making the first experience an unforgettable experience. The event was co-sponsored by 'Thaiya Thaiya' the popular event management company at Tampa bay with Latha Kumar founder of the unit joining the organizing trustees and volunteers in organizing the event while local friend and supporter Dr. Meenakshi Jain extended support at Lanham. The novel musical endeavor helped in reaching across the message of supporting cost free eye care to the indigent in India to the Indian community living in the two regions and raising support for the noble cause. Charity and spirit of service immortalize a great friend and supporter from Georgia! The Carnatic concert fundraiser by singing legend Unnikrishnan at the Hindu Temple of Atlanta, Riverdale, GA on 12th August, 2018 was a classic demonstration of the adage, noble deeds continue to live long after the mortal self is no more. 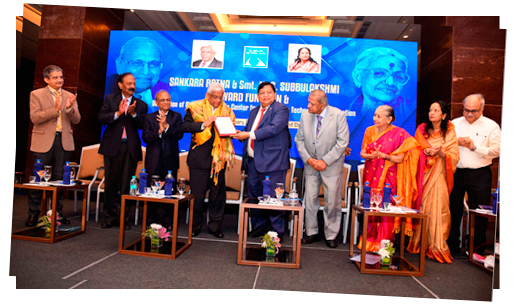 The event was organized by the 'Carnatic Music Association of Georgia', (CAMAGA) India's arts and culture ambassador and the SN OM Trust, as a tribute to the spirit of giving and compassion. Dr Uma Kumar, an eminent Nephrologist and a great friend and generous supporter of Sankara Nethralaya's cost free community services who had played a major role in organizing the event had left on her last journey and a highly moved SN OM Trust and Sankara Nethralaya were holding the concert as a tribute and token of gratitude to her. Maestro Unnikrishnan and his highly talented troupe consisting of Kamalakiran Vinjamuri- violin, Vignesh Venkatamanmridangam amd Sowmiya Narayanan- ghatam surpassed the expectations of the large number of fans assembled, taking them on a journey of mellifluous melody with classical, semi classical and devotional kritis in praise of the Almighty and on the eye, drawn from many languages. The veteran musicians demonstrated their supreme felicity by fulfilling the numerous 'on the spot' song requests of the audience and not confining to the ones planned and rehearsed. 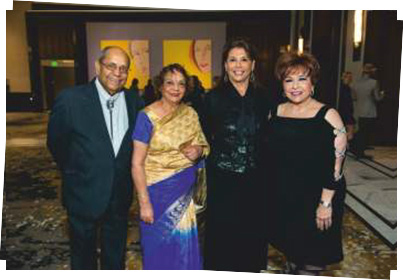 Dr. Krishna Mohan a prominent member of the local Indian community and the American Medical Association (AMA) paid glowing tributes to Dr Uma Kumar, the humanitarian doctor to whom the concert was held as a tribute, he recalled her compassion, generosity and spirit of giving back to society. Founder & President of CAMAGA, Kala Seva Mani Dr Ram Sriram proposed the Vote of Thanks. The event helped in spreading awareness on the services provided by Sankara Nethralaya and raising significant funds towards the same. 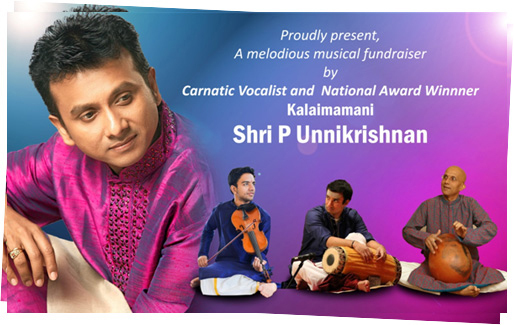 Veteran vocalist Unnikrishnan joined hands with maestros Kamalakiran Vinjamuri - Violin, Vignesh Venkatraman - Mridangam and Sowmiya Narayanan - Ghatam for an extraordinary Carnatic music fund raiser at Maryland on 11th August 2018, the concert titled 'Wind Whispers' was performed as a fusion music or 'Jugalbandhi', enthralled a large audience and captivated them to support the noble cause of blindness eradication in the Indian sub-continent. It was a good example of music becoming a universal voice raised or a noble cause, the artists including senior musician Unnikrishnan consenting to perform cost free brought down the cost of conducting the program and helped in raising significant funds from a relatively new audience. It is noteworthy that this makes the concert long time friend and supporter of Sankara Nethralaya Shri Unnikrishnan’s 3rd cost free performance (2018) for the cause of dispensing cost free eye care to the poor visually impaired in India! 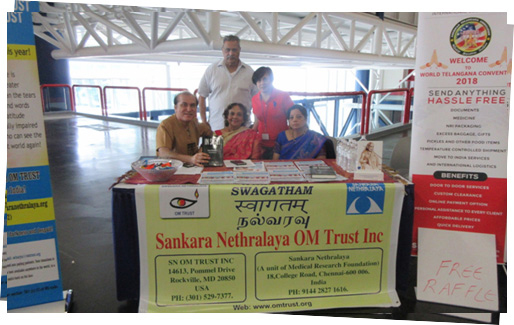 The SN OM Trust booth at the World Telangana Convention- (WTC-2018) being organized by the American Telangana Association (ATA) at the George Brown Convention Center, Houston from June 29th to July 1st 2018 registered a high footfall, drawing many first time visitors from across the USA and Canada. SN OM Trust President (2018) and prominent local citizen Mrs Leela Krishnamurthy made the best use of the opportunity by staying on at the SN OM Trust booth set up at the venue, all through the three days, speaking to the steady stream of visitors, distributing flyers, responding to their queries, she was assisted by cotrustees Dr KS.Vasan, his wife Mrs Nimmi Vasan and Mr Jawahar Malhotra. Long time friends and well wishers Sai Chailakapati, Roopa, Abhishek Bala, Prabha and Sesh Bala, Priya Chandru and daughter Nethra, Rosemin Premji, Padma Srinivasan and Vivek and Nimmi Menon rose to the occasion magnificently, helping in taking SN OM Trust's role and noble goal of supporting cost free eye care to the indigent in India. Mrs Leela Krishnamurthy expressed Sankara Nethralaya's and the SN OM Trust's sincere thanks to Bangar Reddy Aaloor, convenor of the convention and Veerendar Devi Reddy team member for their support in setting up the booth at the high power event. 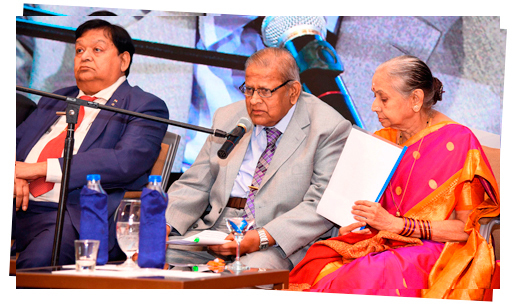 The event helped in spreading awareness on Sankara Nethralaya and raised significant funds for its community endeavors. A touching recognition to the spirit of service and deep compassion! Prominent local citizen, member of the Board, UNICEF & Houston Habitat for Humanity, and President - Sankara Nethralaya SN OM Trust Inc, USA are some proud credentials that could describe the persona of Mrs Leela Krishnamurthy. It was a proud moment to the local Indian community and the service bodies that she serves when the long time champion of social causes and compassionate and caring individual was honored as 'Mother of the Year' by the Tamil Nadu Foundation, (TNF) Houston Chapter. The honor was bestowed at a well attended function held at the Meenakshi Temple, Pearland, Texas on 6th May 2018. The Sankara Nethralaya family joins the members of the SN OM Trust in expressing its pride and joy at the President of its US arm being conferred with a warm and highly touching accolade. It was a classic example of music assuming a divine quality, songs invoking and appeasing the Almighty being rendered with devotion in a divine place of worship, but what made the event supremely divine was the fact that it was being rendered as a homage to HH Jayendra Saraswati Swamigal, the God who lived among us and to support 'Maanave Seva' propounded by him, by the institution which came into being on his divine Will. 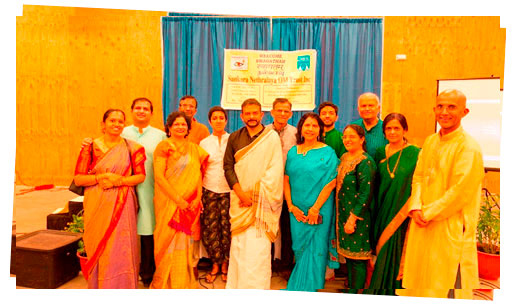 The event was organized by the Bharati Kalai Mandram the well known, social and cultural body at the request of SN OM Trust President and friend, Mrs Leela Krishnamurthy, at the Meenakshi Temple, Pearland, Texas on the 15th of April, 2018. Sikkil Gurucharan among the foremost in today's young talent in Carnatic music and his accomplished accompanists Sanjeev Kumar-Violin and R.Shankarayanan-Mridangam enthralled both seasoned connoisseurs and budding fans with a well chosen selection of songs including Mahakavi Bharathiar's Veeenaiyadi Nee Enakku, Yaaro Ivar yaaro, a song with the eye as the central theme. The memorable feast for the ears was followed by a sumptuous complimentary feast by Shri Rajan Radhakrishnan of the 'Madras Pavillion' the most preferred cuisine destination for Indians in Texas.The musical evening was graced by Shri Arumugam, Past President, Shri Mani Vaitheeswaran, President, Mrs Priya Chandru,Vice President, Vidhya Venkatesan, member, Bharati Kalai Manram., Shri Rajan Radhakrishnan-Propreitor'Madras Pavillion', Mrs Leela Krishnamurthy, President, and Dr KSVasan,Trustee, SN OM Trust Inc, USA. The event helped in creating awareness and raising significant funds for the cause of cost free community eye care by Sankara Nethralaya. We take great pleasure in sharing that the US Federal government which had declared the SN OM Trust as a Tax Exempt Charity under IRS 501 (C) (3) has now approved its participation in the Combined Federal Campaign (CFC) of its employees/retirees. The US office of Personnel Management has listed the Trust as an ‘International Independent Agency’ bearing CFC NO- 68803. This acknowledgement places the SN OM Trust with a select group of charities enjoying such accreditation. This will come into effect from year 2019 and open the doors of the Trust to a large number of employees/retirees of the federal government. We request our esteemed readers serving in the various departments of the US Federal Government to choose the SN OM Trust as their preferred CFC charity and mark CFC number 68803 in their contributions, we also request readers to share this news with friends and relatives serving in the US Federal Government. 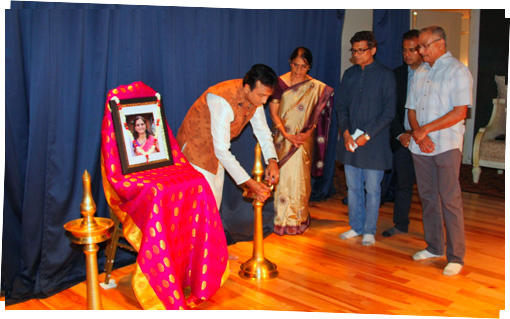 The auditorium at the Hindu Temple of Greater Chicago, Lemont presented a festive picture on the evening of Sunday August 12th, 2018 with Carnatic music aficionados from Lemont and neighbouring areas gathered in good numbers. The occasion was a Carnatic music concert to create awareness on the cost free community service to poor visually impaired patients in India by Sankara Nethralaya the premier, non profit eye hospital in Chennai, among the local Indian community and raise funds in aid of the same, the concert was organized by Mrs Vanita Achar, a long time well wisher, supporter and grand niece of Dr S.S. Badrinath, Founder and Chairman Emeritus, Sankara Nethralaya. The concert began with an invocation to Lord Ganesha by Mrs Vanita Achar, after which she extended a warm welcome to the audience and expressed her sincere thanks for their presence, followed by a brief note on the objective of the concert. Mr. Vignesh Ramakrishnan the ‘Master of Ceremonies’ (MC) introduced the 4 artists of the day’s concert, Smt Minu Pasupathi of Akshaya Music Academy, the Lead vocalist, Ms Akshaya Kannan providing vocal support, Shri Rishabh Ranganathan on the Violin and Shri Sivagangai Vishvak Kumaran on the Mridangam, all of whom were performing cost free for a noble cause, in response to a request made by Mrs Vanita Achar. The highlight of the concert was its thematic presentation, the special effort made to choose kritis having a direct connection with eyes, vision and awakening was very evident and impactful. The first 3 Tamizh songs were as follows - Sadashivakumara, Panneer Kondoru, Kadaikkan Vaitthennai, followed by Shambho Siva Sankar (Sanskrit). This soulful rendition of songs about the eyes was followed by a short 8 minute video about Sankara Nethralaya and its services, especially to the weaker sections of society and the need to support its noble initiatives. This was followed by an ‘Eye Donation Pledge’ drive by Dr Raj Rajaram, supporter and well wisher of Sankara Nethralaya. He highlighted that there was no greater gift to mankind than the ‘Gift of Sight’ and fervently appealed to the gathering to help in bringing the lost light and smile back on the face of the poor visually impaired in their motherland by donating generously. The second part of the concert included the following popular songs - Raaraa Rajeeva Lochana (Telugu), Annapurne Visalakshi (Sanskrit), Kandu Kandu Nee (Kannada) and concluded with the song Man ki Aankhen (Hindi). The audience thoroughly enjoyed the well synchronized performance by the singers and musicians. The event was sponsored by 8K radio, media partner who promoted the event cost free for 2 weeks leading to the event date on their radio and Facebook page. The event concluded with the felicitation of artists, with the audience loudly applauding their sterling performance rendered cost free for a noble cause, as each of them made their way to the dais to be presented with a stemmed rose and honoured by draping of a Pashmina Shawl around their shoulder. Smt Minu Pasupathy the lead artist was honoured with a special memento from Sankara Nethralaya. The evening of fun, filled with soothing music was enjoyed by one and all! The 23rd of April 2018 was a ‘Red Letter Day’ for an institution that came into existence with one simple objective ‘Serving mankind and alleviating suffering of the masses through quality eye care’ it was the day the institution made an auspicious and blessed step towards fulfilling a long time dream, a most cherished dream and also a very ambitious dream. 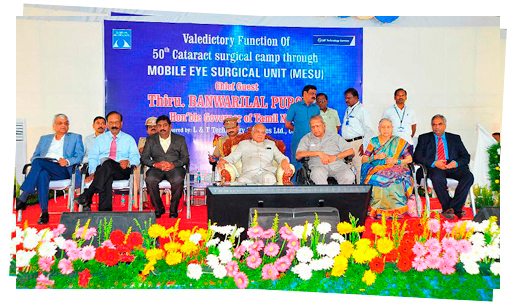 The institution started on the principle of serving eye care totally cost free and with a personal touch to poor patients, had over the 4 decades of its service reached a position of pride wherein it treated 50% of its out patients and performed 35% of its surgeries totally cost free, its cost free eye care initiatives had also recorded magnificent outreach, with quality eye care being dispensed to poor patients in inaccessible, remote regions like the deep interiors of the Sunderbans in West Bengal, Vellimalai Hills in Tamil Nadu and more recently in the tribal regions of Singhbum in the State of Jharkand. Building and operating a large, well equipped and easily accessible community hospital, dedicated exclusively to cost free treatment to indigent patients remained a collective dream of the institution. The idea was to have a State of the Art facility which would cater to a large number of walk-in patients, serve as a referral base hospital to patients screened at the outdoor camps, where they could be brought provided boarding, lodging and free treatment, a place where the institution’s community outreach vehicle including the MESU (MOBILE EYE SURGICAL UNIT) could be parked between their trips. 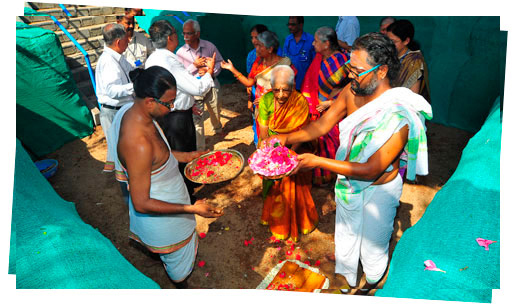 The biggest and first challenge in starting such a large facility, the availability of a large tract of land, in an accessible part of the city was solved when in a most generous and thoughtful gesture Mrs Kausalya Appukutty, Volunteer- Sankara Nethralaya Auxiliary Services (SWAN) made available the same totally cost free at the Dr VG. Appukutty Campus, named in honour of her late husband and generous supporter of Sankara Nethralaya, from where the CU Shah Sankara Nethralaya and the Elite School of Optometry function. The Bhumi puja for the facility was held with traditional piety with the chanting of mantras, vedic hymns and Homam at the proposed site, in the presence of a large number of friends, well wishers and employees. Srimathi Anuradha Narayan, lecturer at the ESO extended a warm welcome to the attendees and expressed the institution’s deep gratitude to Ms Voltas, Ms Infosys, Ms Trent Ltd, the Rahm Sitaraman family, USA and long time friend and supporter Shri Iravatham Mahadevan for their generous donation which would serve as the critical ‘Seed’ capital for the new initiative. Speaking on the occasion Col Raghavan, Director-Projects and chief architect of the initiative observed that the institution was able to embark on a ‘not for profit’ facility with such a high capital outlay only because corporate houses and individual donors open their purses generously when Dr SS.Badrinath the institution’s founder makes an appeal for support. In a moment that captured the spirit of the day, special guest of the event Shri Iravatham Mahadevan expressed that if only he had been 10 years younger he would have visited every home in the locality to mobilize funds for the noble endeavour, the fact that the octogenarian had already made an appeal to the families in his apartment complex became apparent when a co-resident from the complex expressed that every family in the complex would donate towards this noble cause. This was followed by presenting of donation cheques by Srimathi Surekha Mehta, on behalf of SWAN and by Mr Sanjay who operates the staff canteen at the VG Appukutty campus. Greeting the gathering on the occasion well known Litterateur and Editor of popular Tamil magazine ‘Amudhasurabhi’ Shri Thirupur Krishnan, a friend and well wisher recalled the glorious days when he served under Shri Iravatham Mahadevan, a highly principled civil servant, he observed that as a hospital which would be serving the masses it would only be appropriate that it is funded by donations from the common man, he drew a parallel of the same by narrating how Swami Vivekaanda wanted his trip to the World Congress of Religions in Chicago, to be funded by small donations from the common man and not by a few wealthy donors, as he was representing the entire nation. Speakng on the occasion Dr SS.Badrinath, Chairman Emeritus and Founder, Sankara Nethralaya expressed his thanks to all who had assembled and the team working on the project, he had a special word of thanks to Srimathi Kausalya Appukutty, member SWAN for making available the land, without which the project could not have been envisaged. He welcomed and expressed his thanks to special guests Shri Iravatham Mahadevan and Brigadier VS.Joon, Station Commander and President Cantonment Board, for his critical role in obtaining the necessary sanctions and permits for the proposed building, from the Army authorities. Sankara Nethralaya OM Trust presented a captivating and outstanding performance by Carnatic music maestro Shri T.M. Krishna (TMK) on Sunday, April 9th at the Shri Bhakta Anjaneya Temple, Ijamsville in the Greater Washington DC Metro area. TMK was accompanied on the violin by Chi.Kamalakriran and on the mridangam by Kum.Rajna Swaminathan - two local young music talents. Supporters of SN and Carnatic music lovers and fans of TMK not only from the Washington DC Metro area but also from nearby states spanning over 200 miles showed up in large numbers and completely filled the auditorium . The program started with an invocation by Smt. Geetha Bhat. SNOM Trust Treasurer Shri S V Acharya gave the welcome address where he spoke about the Sankara Netralaya’s activities and fundraising efforts. This was followed by artist introductions by SN OM trustee Shri Ramarao Mysore. Krishna did not disappoint his fans and enthralled them with his zestful and eclectic music. The veteran singer moved the heart and soul of the large audience with a repertoire of ragas delivered in his inimitable style. He deviated from the traditional to give a lively folk song with strong messages in the protection of the environment and a united society not divided by caste or creed. This was followed by an eight minute video on Sankara Netralaya’s service to society. The program concluded with SN Om Trustee Shri Krishna Raj Bhat proposing the vote of thanks followed by a sumptuous dinner. 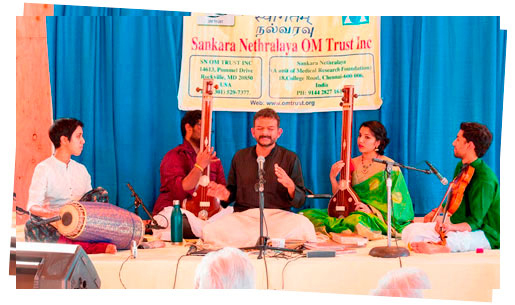 Overall it was a great concert and Sankara Natralaya was also able to reach its message across to a wide array of people and the SN OM Trust received a major boost in its fund raising initiatives, thanks to the efforts of all the trustees, volunteers and well-wishers. 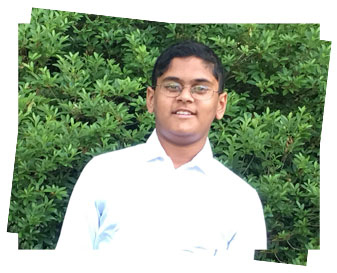 Bubbly youngster from Maryland exhibits amazing compassion and concern to Sankara Nethralaya's cause! Age 12 is a phase in life when music and music instruments simply mean good fun and entertainment to most, little Jay Kannan proved that he was a little different, in a rare exhibition of maturity and understanding the little boy showcased that music can be the language of the soul. A video on Sankara Nethralaya's cost free community service to the poor and needy and the change it brought in their lives, that he happened to watch at the university of Maryland, had a deep impact on him, it triggered a deep resolve that he should do something for them. Shri Amudhan Kannan and Srimathi Vidya Thirumalai the noble parents of a worthy son put their energies together to fulfil their son's dream, their request to families in the neighbourhood evoked a spontaneous response and soon their home in North Potomac became the venue for a wonderful musical fund raiser for the cause of the poor visually impaired in India, with budding musicians playing instruments of every kind, for a noble cause. The event helped in creating awareness on Sankara Nethralaya and its services in the minds of the little musicians, their parents and the audience and raised a significant donation towards the cause that moved little Jay Kannan's heart. 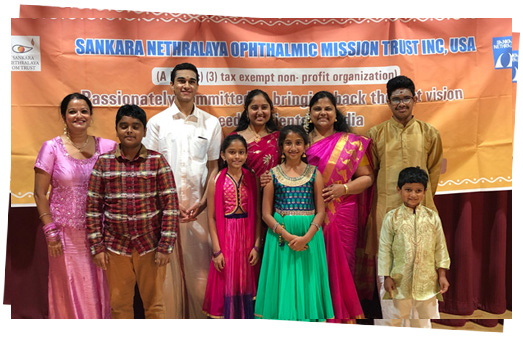 Nothing gives more pleasure and pride to members of the Sankara Nethralaya family and its head than to receive the institution's overseas ambassadors, the members of the Sankara Nethralaya Ophthalmic Mission Trust, engaged in spreading awareness and raising funds for its cause in the USA. 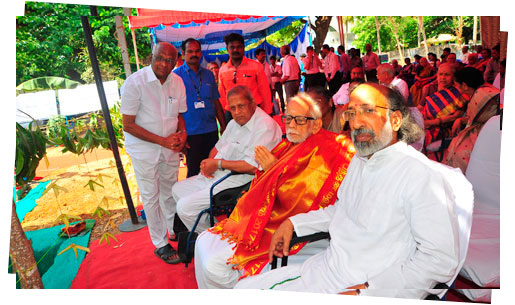 It was a moment to cherish for members of the institution, when long time friend, supporter and former member of the SN OM Trust Shri KG.Venkataraman and Srimathi Banumati Ramakrishnan, Treasurer, SN OM Trust accompanied by her husband Shri Ramakrishnan visited the institution recently and spent some quality time with them. 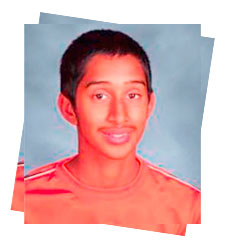 My name is Keshav Parthasarathy and I am currently studying to be a doctor in the United States. This summer, I was given the opportunity to work as a volunteer for Sankara Nethralaya. During this period, I chose to spend much of my time at the Jaslok Comunity Ophthalmic Clinic (JCOC) the free clinic that SN provides the impoverished. At the free clinic, I would work closely with the secretaries in helping direct the patients to where they needed to go to get the procedure they needed done. I would also observe in the slit lamp room, and the presiding doctors would explain how the instruments and procedures were performed. I really appreciated the time the doctors and staff gave me throughout my time at SN as well. Although they were almost always busy due to high influx of patients coming into the clinic, they all made time to answer my questions and teach me as much as they possibly could. This was incredibly beneficial to me because there are a lot of intricacies to the system employed at the free clinic. With the secretaries’ help, I learned how best to answer patients’ questions and how to log certain procedures in the computer. With the doctors’ help, I learned how to syringe patients and observe the eye using the slit lamp. This willingness to help no matter the situation was a characteristic that I found abundant in both SN’s employees as well as SN as an organization. Every person that I interacted with during my time at SN was extremely humble and respectful of me. There could not be a more momentous occasion to an institution and its Founder ingrained with the quality of gratitude and reciprocity than acknowledging the deeds and honouring the great men and women who have empathized with its cause and made it what it is today. The Sankara Ratna and Dr MS.Subbulakshmi awarding ceremony being held at the stately Rajendra hall at the ITC Grand Chola on the 27th of Janary 2018 reflected this in no small measure. 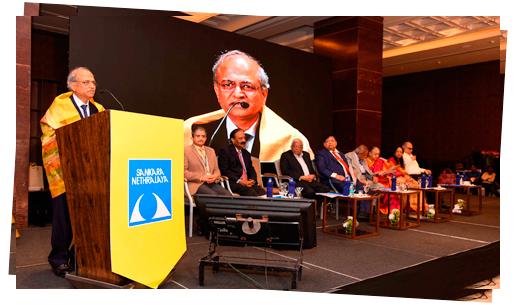 The high profile of the awardees and the Chief Guest conferring the awards had quite naturally raised a lot of expectation and made it a most keenly awaited event within and outside the institution. If the smooth flow of the proceedings were a testimony to the excellent planning that had gone behind the event, the spirited observations and spontaneity of the awardees and the Chief guest made it exceed all expectations, keeping the filled to capacity hall absorbed, informed and entertained. The close to 3 hour program turned out to be an epic of sorts, little wonder that it did so, given thefact that the achievements, name and fame of the man and woman being honoured had assumed epic proportions and the award was being conferred by a legend. Srimathi Akila Ganesan, Director, Administration, Sankara Nethralaya set the tone for the evening with a succinct note on the awards, as the gesture of gratitude and honouring by an institution created for the people and by the people, to the great men and women who had empathised with its cause and supported it in its journey of providing quality eye care to those who could pay and those who could not! 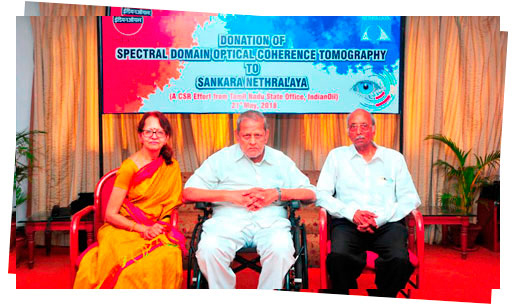 Dr KS.Vasan, Managing Director continued the Sankara Nethralaya saga where Srimathi Akila Ganesan had left, with a most interesting account of how the institution had grown from its humble beginnings to a world class, tertiary ophthalmic centre encompassing clinical care, research,teaching and training and community eye care within its fold. He traced the inception of facilities in the city and other parts of the country, the steady growth of an institution committed to reaching out its services without diluting its quality, principles and philosophy. The senior Sankara Nethralaya official touched a chord in every heart with his emphatic account of how the Founder and Chief steward of the institution Dr SS.Badrinath was seized by a single idea, dream and mission and how it controlled his life,brain,muscles as advocated by Swami Vivekananda and how it became a reality in the form of Sankara Nethralaya. Dr.Vasan closed his talk with a strong emphasis on the social and economic impact of the innovations and service rendered by the institution and a strong appeal to join its mission. The awarding ceremony was a spell binder with interesting, inspiring and amazing glimpses of the day’s awardees and the celebrities assembled to honour them flowing as a steady stream. Less known, inspiring, moving facts like Shri AM.Naik the hero of corporate Indian folklore bequeathing 75% of his wealth to charity and how the Naik and Nirali trusts founded by him were revolutionizing the countryside with their trailblazing health and education initiatives. The deep commitment of Shri Deepak Parekh, the voice of corporate India,to the values of humility, accessibility, accountability and transparency and his simple logic and conviction that ‘corporate giving’ was a natural concomitant to ‘corporate earning’. 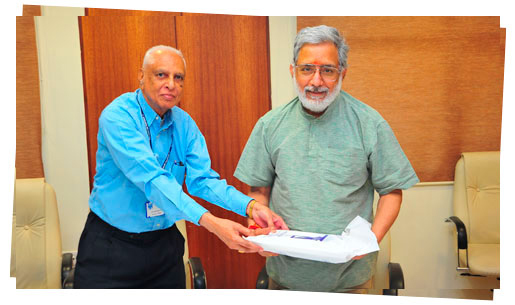 The memorable day when legal legend Nani Palkhivala summoned Shri Deepak Parekh to his home and in a gesture of boundless generosity and faith requested him to divest his life savings in the form of shares and other holdings and transfer the same to Sankara Nethralaya, after just one visit to the ‘Temple of the eye’. The Sankara Ratna awardee’s invaluable role in bringing illustrious members from the nation’s business capital to empathize and support Sankara Nethrlaya, of whom was Dr BR Barwale, the father of India’s seed industry, whose company contributedto the setting up of the clinical care block at the SN main campus named after it as Mahyco block (Maharashtra hybrid seeds company). A touching account of how this key player in India’s green revolution donated the entire prize money he received with the ‘World Food Prize’ to research in agriculture. 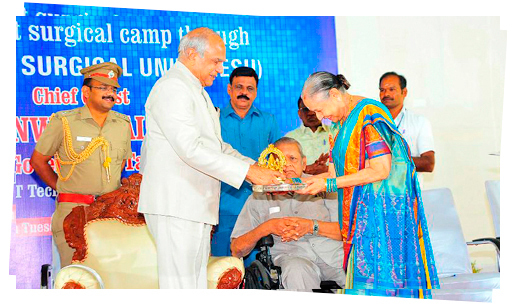 Srimathi Vani Jairam’s warm note on her experiences with MS Amma after whom the award she was receiving is named, the rich compliments she received for her manner of singing from the immortal, legend. Touching accounts of how the ‘Meera of Modern India’ had toured large parts of rural Maharashtra, propagating social values and causes through her golden voice, travelling all the way to Iowa to render the invocation at the function honouring Dr.Barwale with the ‘World Food prize’ known popularly as Norman Borlaug award. The evening marked a giant leap in leveraging technology for better dispensing of eye care by the two times winner of the prestigious NASSCOM-KPMG awards for ‘Best IT adoption on the healthcare sector’ and ‘Best Electronic Medical Record (EMR) solution’ with the dedication of the Dr BR Barwale centre for ophthalmic technology and innovation, which would focus on developing and implementing technologies to enhance reach and quality of eye care to the masses. Speaking on the occasion Chief Technology Officer Shri Chandramouli explained on how the new centre will endeavour to make the enormous data available with the institution actionable for practitioners and stakeholders. Speaking with a strong sense of nostalgia a visibly overwhelmed Dr SS.Badrinath recalled that he came to India with just four dollars and times have been indeed been very good and eventful and he considered himself very blessed to have been able to give shape to his dream of starting a world class eye care institution, he expressed that the past has been very good and the present is also very promising and hoped that the future will be good too. 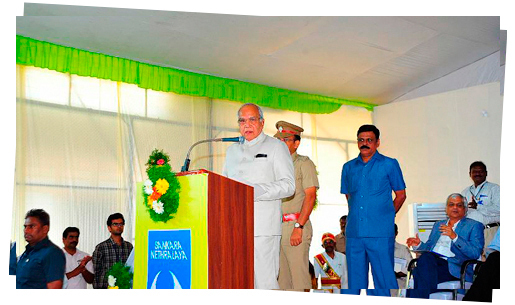 He thanked his colleagues for the hospital being rated as the best in its kind and went on to highlight a few major Sankara Nethralaya landmarks like the success of the MESU which reported absolutely no complications, being the only eye care institution providing technology support to 9 eye care institutions, the impact of Polymerase Chain Reaction (PCR) process aided by artificial intelligence developed by the institution. 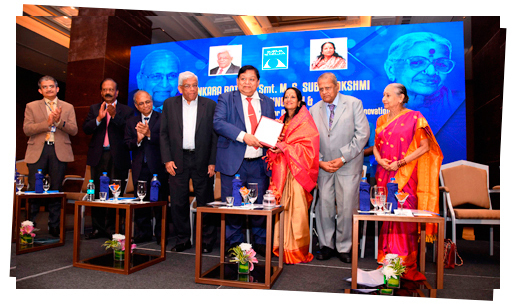 He recounted with gratitude Sankara Ratna awardee Shri Deepak Parekh’s rare gesture of sanctioning a huge loan from the HDFC to Sankara Nethralaya by instructing his officials from the USA, when it was negotiating for the acquisition of the erstwhile lady Willingdon Hospital. While it was natural that the evening resonated with the greatness of the great personalities whom the ‘Temple of the eye’ had chosen to honour on this momentous occasion, the inspiring and laudatory references on the host institution, the detailed account of its services and achievements and the need to support it, made by the awardees and the chief guest and the guest of honour made one wonder if even the representatives of Sankara Nethralaya could have made such a strong case about themselves, as its friends and well wishers gathered on the occasion had done. The spirited references to the institution in their acceptance speeches by the awardees and the chief guest’s address made one wonder if SankaraNethralaya was felicitating its friends and supporters or was being felicitated by them on this memorable day! A glorious example of the Bard’s immortal lines ‘The quality of mercy is twice blessed; it blesseth him that gives and him that takes’.